“One remarkable aspect of the shale gas revolution is that it was not the product of an energy policy edict from Washington, or the result of a bruising political battle to open up public lands and offshore waters for new exploration. Although the Halliburtons of the world are now big in the field, its pioneers were mostly smaller risk-taking entrepreneurs and technological innovators. George P. Mitchell, an independent producer based in Houston, is widely credited as being the prime mover in shale gas, pushing the idea against skeptics. The technology was mainly deployed on existing oil and gas leaseholds or on private land beyond the reach of bureaucrats (for the time being, anyway). That is why shale gas seemed to sneak up unannounced to the media and Beltway elites, even though people inside the gas industry realized several years ago what was rapidly taking place. Mitchell worked the Barnett shale formation near Dallas, but the biggest shale gas “play” is the Marcellus​—​a massive deep shale formation stretching from West Virginia through upstate New York. 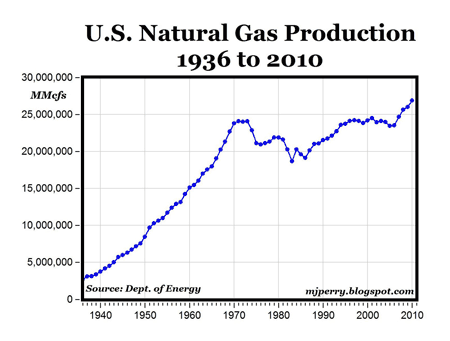 MP: The chart above displays annual natural gas production in the U.S. back to 1936, and shows that domestic production has set new annual records in each year since 2007. For the last several years the U.S. has been the world’s largest gas producer starting when it surpassed Russia in 2009. Will Oil Continue Heading Higher?